Heights Public Market at Armature Works opened up earlier this year and when I heard what places were there, I was obsessed immediately. I quickly already followed each eatery on Instagram so I could scroll and see what they offer. I was on vacation a couple weeks ago when my friend Tia invited me out to eat since it was her first time going too. When I first walked inside Heights Public Market at Armature Works, I thought it was interesting how quiet it is when I first walked in. That all changed when I got to the market. As soon as I step foot inside, all the conversations going on combined into a rumbling that went around the entire building. The great thing about the market is there’s bomb lighting so I could easily get my IG pics and stories off. Tia and I looked at the menu beforehand so we walked in knowing what where we were eating. We did a quick walk through looking for where everything is then we dove right in. 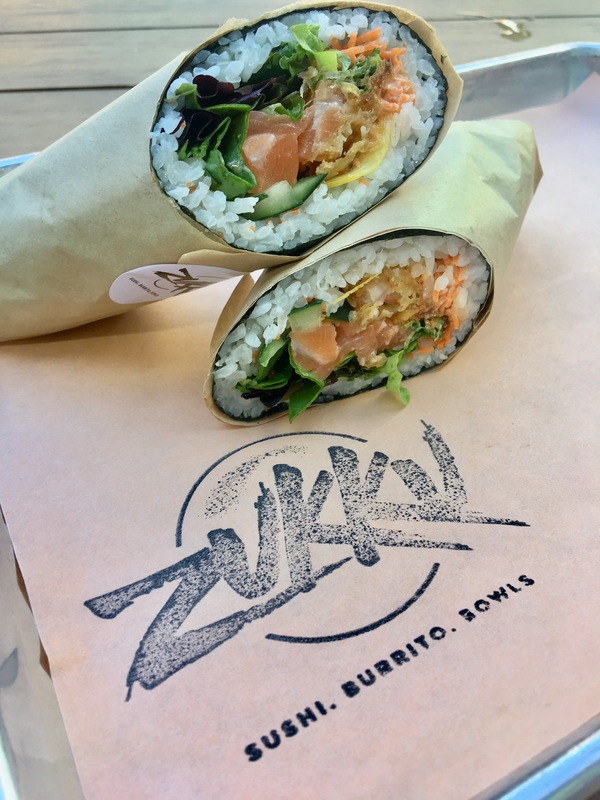 The first thing we ate is The Atlantic sushi burrito at Zukku. The burrito is a combo of salmon, shrimp tempura, salmon bacon, masago, veggies, lemon slices, and a spicy aioli sauce. I’m pretty sure I looked like a little kid watching the burrito being made. The employee makes the burrito so effortlessly and not a piece of salmon or veggie slice fell out #LowkeyJealous. After a few bites of the burrito, the lemon slices crept up on me with a subtle, citrusy flavor. The veggies bring a cool factor to the spicy aioli. The burrito is a great idea if you want a crunch and are looking for something different from the usual sushi rolls. For those that enjoy eating breakfast and/or brunch all day, Graze 1910 is for you. Their menu ranges from the regular waffle to sandwiches. 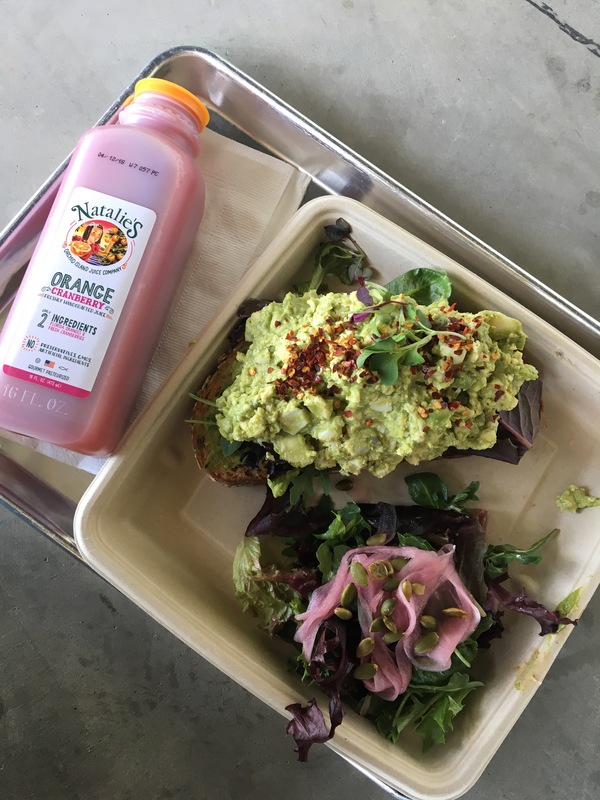 I tried the Avocado Egg Salad Tartine, 1 of the 6 tartine options to choose from. *eyeroll* Now we all see how millennials love avocado toast but YOLO, you know? The soft avocado on top of the crisp, toasted bread is satisfying and I didn’t feel like it was a lot to eat. If I’m eating something else off the menu, I think the tartine is a good choice as a sort of appetizer. 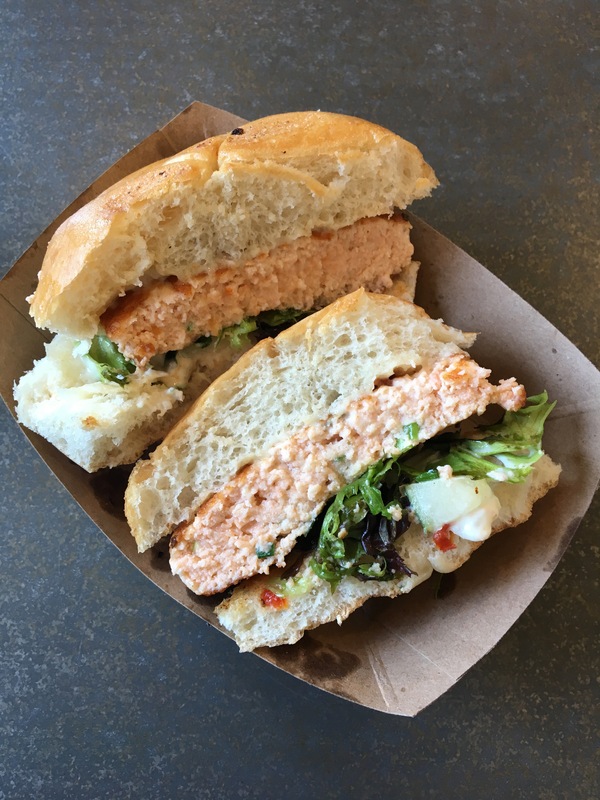 Surf and Turf began as a food truck in the Bay Area prior to being in Heights Public Market. In addition to serving seafood here, they also serve New Jersey and Pennsylvania. I’m trying to eat healthier so I went with the Salmon Burger. Everything on this burger is soft from the buns to the fish. I couldn’t leave without getting some dessert. Astro Ice Cream Co. offers the regular soft-serve and nitrogen ice cream. I enjoy trying crazy ice cream flavors because it’s a party on my tastebuds. The Cotton Candy Twister flavor tastes just like the popular fair food and comes with a tiny piece. The first topping is free so the cashier recommended I get gummy bears on top since that’s what she goes with. Can you tell I’m a complete adult yet?? Overall, Heights Public Market at Armature Works is perfect for going out with a group of friends because there’s so much to offer and everyone can just eat off each other’s plates. Tia and I plan to go back at some point to try out the rest of the restaurants. Have you been to Armature Works yet? What’s your favorite thing there?